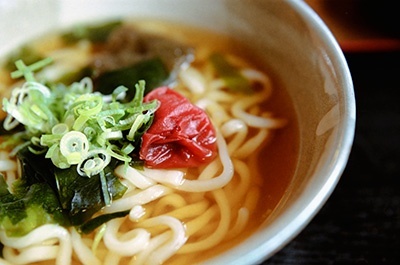 Less sodium, increased protein and more convenience fits the needs of consumers looking for high-quality comfort food without extravagant preparation. The ingredients derived from milk offer the chance to achieve these benefits without adding unrecognizable ingredients to product labels. Consumers want to relax after a long, busy day and are drawn to beverages that reduce stress and promote better sleep. The proteins derived from U.S. milk provide unmatched nutrition which may help consumers wake-up refreshed and energized. Vinegar-based functional beverages have been around for centuries. This traditional ingredient is resurfacing in beverages through switchels reappearing on shelves. 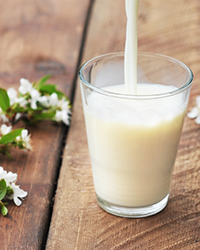 Thanks to dairy’s nutrition, our take on the Switchel has high-quality protein produced by dedicated U.S. farmers who are focused on animal care and environmental stewardship. In this four-part series, we will explore the unique dairy prototypes being served by USDEC at the Institute of Food Technologies (IFT) Annual Meeting and Food Expo 2017. 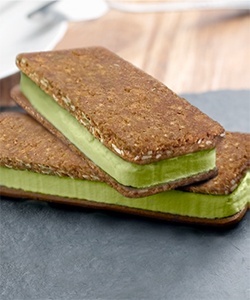 First up is the Frozen Matcha Dairy Bar, which includes a matcha-flavored yogurt filling between two crispy oat wafers. Sound good? Come try it during IFT17 — USDEC will have samples to try at Booth 2270. If you’re not attending, you can read more about it in the formula sheet available to download at the end of this post. Snack formulations are getting more complex as consumers view snacking as more than a filler between meals. 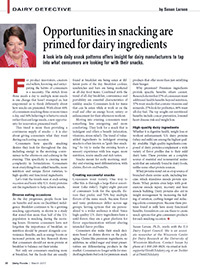 Susan Larson, Associate Researcher at the Wisconsin Center for Dairy Research at the University of Wisconsin – Madison, says that even though more consumers snack throughout the day, formulators shouldn’t rush to put product on the shelves without first considering the claims that consumers want most. Successful snacks offer what consumers want for each meal occasion.